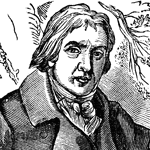 Edward Jenner was an English medical doctor and scientist whose discoveries contributed to widespread smallpox vaccination. He was a member of the Royal Society and was appointed Physician Extraordinary to King George IV. FCIT. "Edward Anthony Jenner author page." Lit2Go ETC. Web. 19 April 2019. <https://etc.usf.edu/lit2go/authors/109/edward-anthony-jenner/>. FCIT, "Edward Anthony Jenner author page." Accessed April 19, 2019. https://etc.usf.edu/lit2go/authors/109/edward-anthony-jenner/.